Cupressus macnabiana var. bakeri (Jeps.) Jeps. Cupressus bakeri, reclassified as Hesperocyparis bakeri, with the common names Baker cypress, Modoc cypress, or Siskiyou cypress, is a rare species of cypress tree endemic to a small area across far northern California and extreme southwestern Oregon, in the western United States. The tree grows in a small section of northern California within Siskiyou, Modoc, Shasta, Plumas and Tehama Counties; and very localized in southwestern Oregon in Josephine and Jackson Counties. It is usually found in small, scattered populations, not in large forests, at altitudes of 900–2,000 metres (3,000–6,600 ft). This includes locales in the Modoc Plateau, southern Cascade Range, Klamath Mountains, and northern Sierra Nevada. It is slow-growing in the wild, and is mostly restricted to sites difficult for plant growth, on serpentine soils and on old lava flows. Its tolerance of these sites enables it to avoid competition from much faster-growing trees. It is found in chaparral and Yellow pine forest habitats. Cupressus bakeri−Hesperocyparis bakeri is an evergreen tree with a conic crown, growing to heights of 10–25 metres (33–82 ft) (exceptionally to 39 meters−130 feet), and a trunk diameter of up to 50 cm (20 inches) (exceptionally to 1 meter—40 inches). The foliage grows in sparse, very fragrant, usually pendulous sprays, varying from dull gray-green to glaucous blue-green in color. The leaves are scale-like, 2–5 mm long, and produced on rounded (not flattened) shoots. 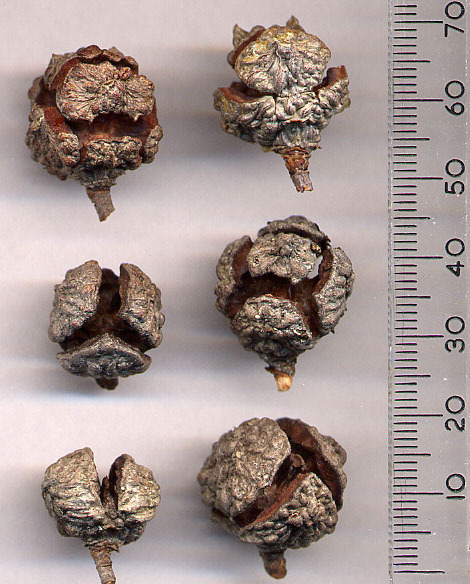 The seed cones are globose to oblong, covered in warty resin glands, 10–25 mm long, with 6 or 8 (rarely 4 or 10) scales, green to brown at first, maturing gray or gray-brown about 20–24 months after pollination. The male cones are 3–5 mm long, and release pollen in February–March. Fire suppression policies of the past decades have severely limited reproduction of this fire dependent species. It is listed as an IUCN Red List vulnerable species. ^ Farjon, A. (2013). "Cupressus bakeri". The IUCN Red List of Threatened Species. IUCN. 2013: e.T34047A2841226. doi:10.2305/IUCN.UK.2013-1.RLTS.T34047A2841226.en. Retrieved 9 November 2017. ^ a b USDA: Hesperocyparis bakeri . accessed 8.28.2015. ^ The Plant List, Cupressus bakeri Jeps. ^ Jepson eFlora (JM2): Hesperocyparis bakeri[permanent dead link] . accessed 8.28.2015. ^ a b CalFlora Database: Hesperocyparis bakeri . accessed 8.28.2015. This page was last edited on 14 January 2019, at 18:51 (UTC).